Air-sea exchanges in the Southern Ocean of momentum, heat, freshwater, carbon dioxide, and other gases are not well documented because fluxes are sparsely sampled (see Figure 1) and because high winds, high sea state, and lack of calibration for bulk formulas make them difficult to determine. New developments, both for in situ observing approaches and for data interpretation, offer a possibility for advancing understanding in ways that were not previously possible. Making use of these new developments to improve flux estimates provided the framework for a workshop hosted by the European Space Research Institute in fall 2015. The 48 participants included specialists in technologies such as surface moorings, wave gliders, unmanned aerial vehicles, remote sensing, modeling, and assimilation. Standardizing Essential Climate Variables. One limitation for improving surface fluxes at all latitudes is that they have not yet been classified as essential climate variables (ECVs) or essential ocean variables (EOVs) for use by the United Nations or the Intergovernmental Panel on Climate Change, meaning that specific measurement standards have not been established for minimum spatial and temporal density of observations, accuracy, and long-term stability. Workshop participants recommended that steps should be taken to define air-sea fluxes as ECVs or EOVs, particularly for those fluxes that can be measured directly and for which there is consensus about measurement methods (e.g., air-sea heat and momentum exchanges using the eddy covariance method). Developing a Pilot Study. 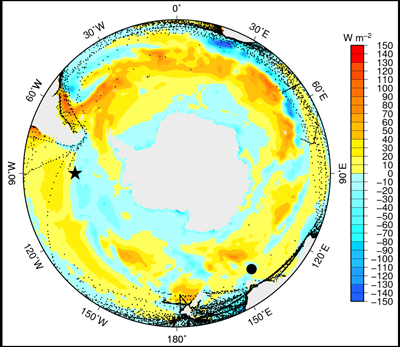 Workshop participants supported the development of a pilot study, including intensive observations centered at one of the existing air-sea flux moorings in the Southern Ocean, such as the Ocean Observatories Initiative mooring (black star in Figure 1) or the Southern Ocean Time Series (black circle in Figure 1). Even on yearly scales, fluxes exhibit substantial spatial variability in the vicinity of the mooring locations. Goals of the pilot study would be to characterize spatial and temporal scales of variability of fluxes; to refine bulk formulas used to compute fluxes from easily measured meteorological variables; to integrate in situ point observations with remote sensing, modeling, and assimilation; and to test new approaches and technologies viable for observing air-sea fluxes. Establishing a Working Group. Participants supported the development of an international air-sea flux working group sponsored by the Southern Ocean Observing System (SOOS) to coordinate the proposed pilot study and oversee the task of defining flux requirements. This working group has since been coordinated and is open to any interested contributors. Sponsorship for the workshop was provided by SOOS, the World Climate Research Programme, the European Space Agency, the U.S. National Oceanic and Atmospheric Administration, and the U.S. Climate Variability and Predictability (US CLIVAR) program. Citation: Gille, S., S. Josey, and S. Swart (2016), New approaches for air-sea fluxes in the Southern Ocean, Eos, 97, doi:10.1029/2016EO052243. Published on 13 May 2016.